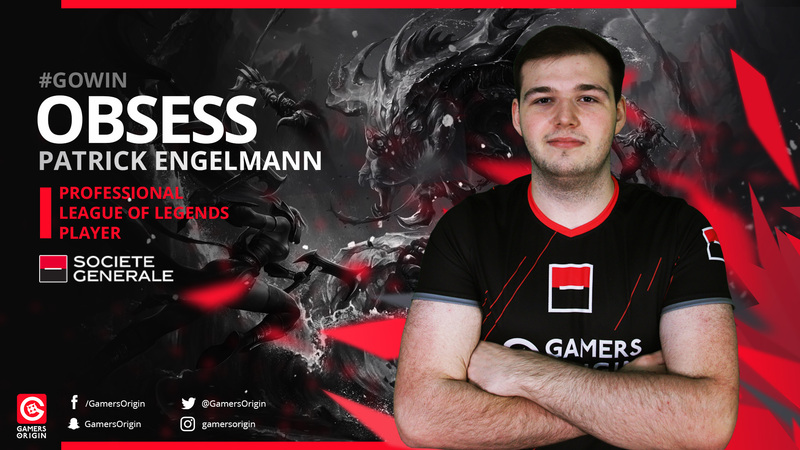 Patrick “Obsess” Engelmann has joined GamersOrigin as the League of Legends team’s new jungler, in partnership with Société Générale. Obsess was subbing for Misfits, which has been in EULCS, the European heights level, for several seasons. The German jungler had been part of the Spanish org Movistar Riders and Penguins too. Patrick Engelmann is replacing Kristian “TynX” Hansen who is now a substitute for the team. With him, GamersOrigin will take part in the season’s last competitions: the Valenciennes Game Arena this weekend, the LoL Open Tour Parisian stage, the Solary Cup and the French championship playoffs. Furthermore, Christian “Sleeping” Tiensuu will be our toplaner during the Valenciennes Game Arena. Phaxi has health problems meaning that he needs to be replaced for this competition only. The Valenciennes stage matters because it will be one of the two lasts for the Open Tour before the final in Disneyland Paris on November 24th. GamersOrigin has won the ESWC Metz and will face high excpectations, and we are determined to keep our first place on the ladder. Being a substitute for Misfits is probably the best experience I have had. I met a lot of awesome people this split and I got the chance to learn from the best jungler and the best coaching staff in Europe. It is an awesome organization that provides as much as possible for its players. I am really excited to compete with GamersOrigin: I have never played in a LAN and I have no offline experience either. It is very exciting to get the chance to prove myself and to earn that experience with one of the most well-known French org #GOWIN.